The chronograph watches are considered as the most sought after pieces by the watch connoisseurs. It is assumed that most young men prefer chronograph watch to any other type. A chronograph watch is an innovative number which has a stopwatch or timer and features buttons or Pushers with a start, stop and reset function. Today, chronographs have taken the world of watches by storm. Many watch brands are introducing new features to their chronograph watches to fascinate watch lovers. One brand that has been investing in innovative technology to give the world best collection of chronograph watches is Rado. Rado watches are known for its innovative design, premium ceramic material, and cutting-edge technology. These watches are lightweight and hypoallergenic, thus offering great ease to the wearer. Rado watches are appreciated for durability and comfort. The watches by Rado boast of a uniquely resistant high-tech diamond surface which makes them tough and sturdy. 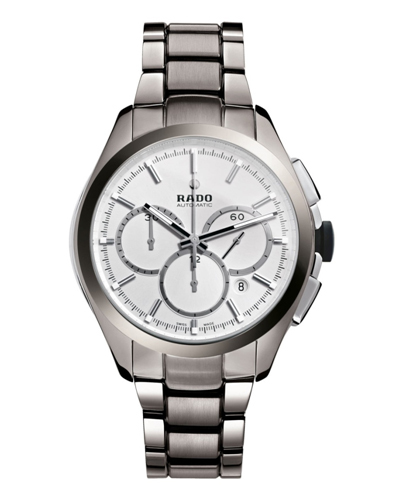 Enjoy the durable transparency in Rado Chronograph watches as the brand uses the sapphire crystal on its surface. The chronograph watches from Rado are also scratch resistant as they are crafted from exceptionally robust material.Take a glance at some of the chronograph watches by Rado that are high on style and utility. RadoHyperChrome Automatic Chronograph is one of the best automatic chronograph watches. The automatic movement of this Rado Chronograph watch is meant to impress those who look for modern engineering. The dial is lightweight, and the stainless steel transparent sapphire case back with anti-reflective coating makes this watch durable. You can enjoy diving in the swimming pool wearing this watch as it is water-resistant too. Team this chronograph with your casual outfit and sport that cool attitude. 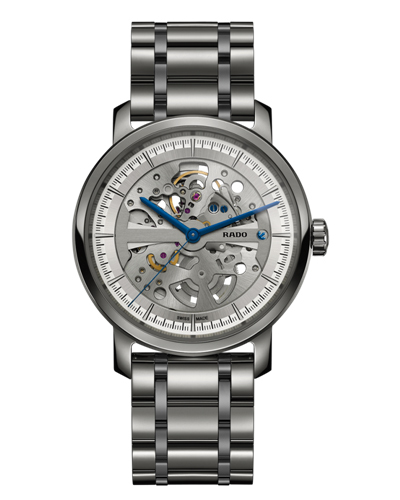 RadoDiamaster Automatic Skeleton is a limited edition of DiaMaster series. This automatic chronograph watch will impress you with its size 41 dial. The bezel and the strap of this chronograph is light and antiallergenic. The transparent sapphire case backwith anti-reflective coating adds an edge to this time piece. The main skeleton design of the dial is the spotlight. Wear this watch and show your rugged style. This black and gold HyperChrome Automatic Chronograph watch from Rado is a perfect example of sophistication and comfort. The high-tech ceramic material is used in the making of bezel and strap of this watch, thus making it lightweight and comfortable to wear. The stainless steel transparent sapphire case back with anti-reflective coating makes this watch a masterpiece. 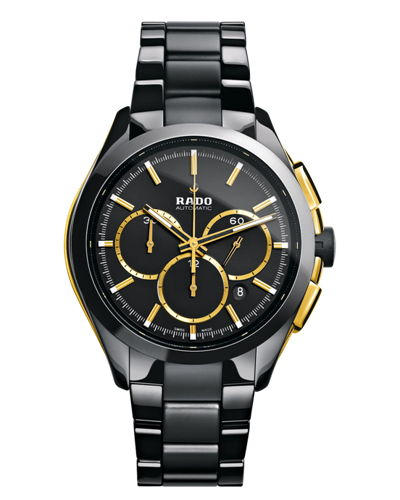 The dial of this Rado Chronograph watch looks beautiful in black and gold colour. This water resistant chronograph watch is definitely going to be a wonderful addition to your watch collection. 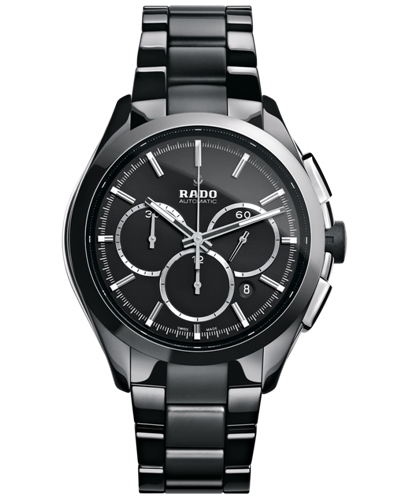 This black Rado Chronograph watch is sure to take your style quotient a notch higher. 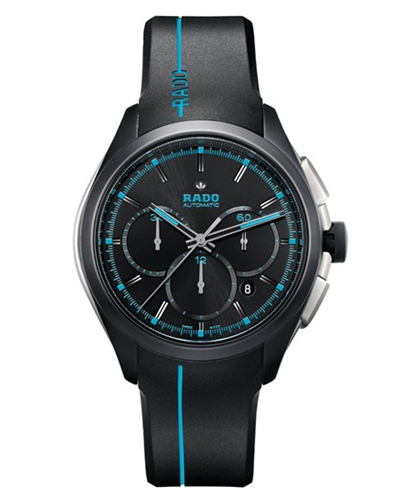 This automatic chronograph watch from the brand Rado boasts of some very classy features. Its 45 sizes black dial makes a solid style statement. The bezel and the strap are made of premium ceramic material, thus making this watch robust and durable. The 10 bar water resistance feature makes this watch suitable to wear even when you are swimming in the pool. This chronograph watch is sure to add a charm to your look. Smart and Suave, this automatic chronograph wrist watch from Rado will be a classy addition to your watch collection. This 44 mm watch features black and blue round dial. The case is made of ceramic and silicone strap with blue stripes add an appeal to this wrist watch. The blue indexes on the dial give a vibrant touch to it. Grab this automatic chronograph and flaunt your excellent taste in technologically advanced watches. So, if you are buying your first chronograph watch, then these are just a few of them that you can think to invest in. Online watch retailers like Zimson too offers a range of chronograph watches from leading brands. Depending upon your taste and needs you may buy one of the Rado watches to make your own style statement. These automatic luxury chronograph watches are definitely going to add charisma to your personality.